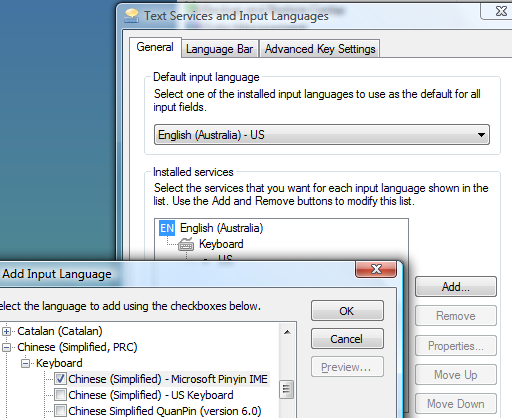 So you want to type chinese characters in Windows? Here’s how you can do it without installing other third party applications such as NJStar, ChineseStar or Chinese Communicator. 2. Select the Keyboards and Languages tab. 3. Under the General tab, press the Add button and select the chinese input type that you want to use. In my opinion, Microsoft Pinyin IME is the easiest to use and if you speak Mandarin, using pinyin is just like “spelling” a chinese word in english. 4. That’s it. After installing it, a new button will appear at your taskbar allowing you to choose your input language.